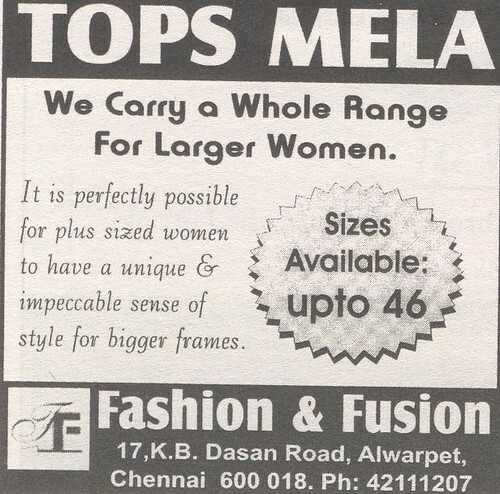 I am afraid this ad may attract action under one or more of the plethora of laws against direct or implied (or even thought crimes) mental harassment of women! Pray tell me which woman will accept that she falls (!) into the category of “Larger women”! Very undiplomatic indeed, but surely very useful service, considering the liberal girth of some of our aunties! I visited your web site. Nice to know you have varied interests. You may like to visit my Thamizh blog here. I have written about about your favourite iddlies, have some carnatic music podcasting and more!